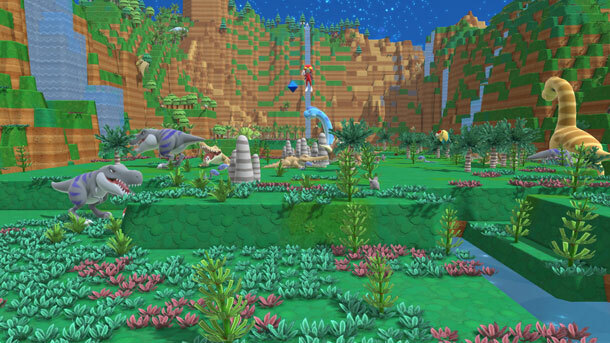 Birthdays The Beginning was a delightful game for a number of reasons. Firstly, it had incredibly gorgeous art, with each of the game's creatures being based on clay sculptures by one of Japan's masters of the form. Secondly, it was so remarkably well intentioned; the game's one and only goal was to give players a sense of how ecosystems have developed and evolved over time, and in the process, encourage them to learn more and care for the delicate balances that we find in our real world ecosystems. Coming from the man behind the Harvest Moon series, Wada Yasuhiro, none of that would be of any surprise. Wada's calling card is in giving players gently charming, non-violent experiences about humans living in harmony with, and encouraging the growth and vitality of, nature. 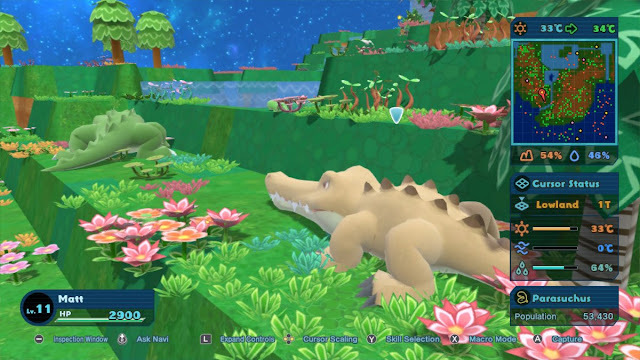 I personally absolutely loved Birthdays The Beginning. I ended up spending an awful lot of time in the game, as much watching the endlessly charming animals running around as actually playing the game. Indeed, I sometimes struggled to play because the nature of evolution means that some species would go extinct, and I just hated the idea of the cute clay-designed dinos disappearing off my little biome. But, of course, what replaced them was every bit as cute, and so I simply found myself playing through over and over again to immerse myself in the wealth of characters and detail that Wada had implemented into his game at each point of evolution that it covers off. 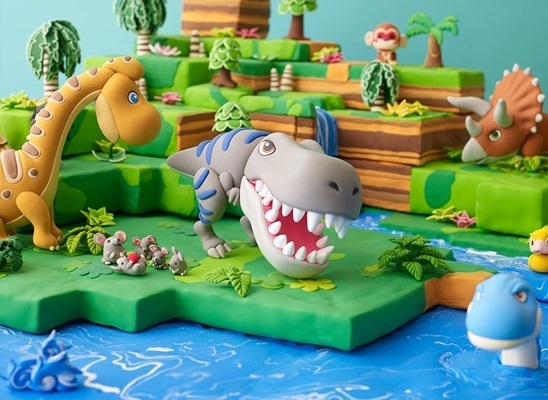 Happy Birthdays is a Nintendo Switch port of Birthdays The Beginning, but with a significant number of refinements and improvements that make it a much easier and more accessible game to get into. It loses a little in that the character designs are just so perfect that they call for the big screen experience, but on the other hand, Birthdays' gameplay is ideally suited to the handheld side of the Switch experience. Overall, I do think that people will see this as a massive improvement and the definitive Birthdays experience. 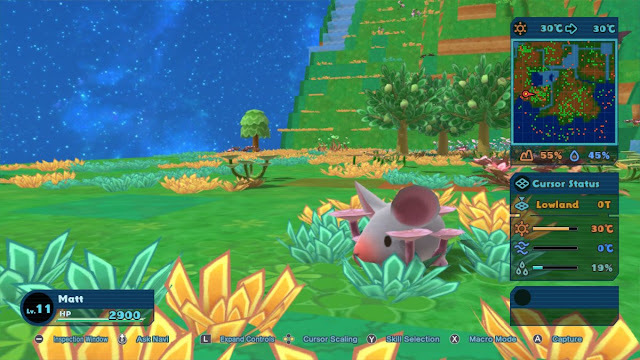 The most significant refinement for a newcomer is that in Happy Birthdays now possible to play the game with a pre-establish biome. 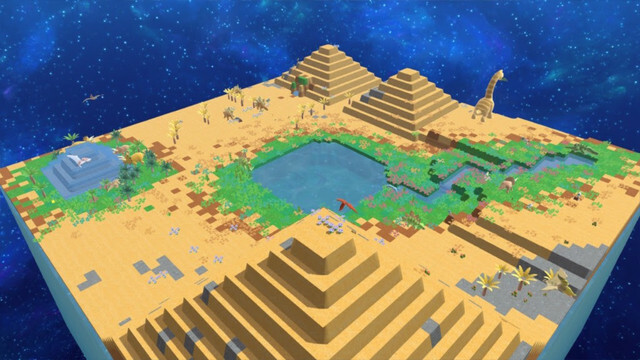 In the original Birthdays you would start the game with a literal blank slate; a flat, featureless plane of rock in which your role, playing "God" was to slowly manipulate by raising mountains and sinking oceans to the point where the most basic of lifeforms would form and then, slowly, continue to manipulate things so those basic lifeforms could evolve into more complex creatures. On the one hand this was the most thematically appropriate way to start the game; after all, evolution itself started from single celled organisms, and as Birthdays wants to be educational on a fundamental level, forcing players to play through this earliest of early eras was the most authentic way of doing so. On the other hand, this method also meant that the start of the game was the most painful grind; sure the jellyfish and sea plants that you'd spend a huge chunk of time at the start were cute, but the whole time the typical player will be thinking "bring on the dinosaurs already". In Happy Birthdays you can pick from a couple of different pre-set "scenarios" in which evolution has already passed to a reasonably advanced state, and the world is lust with both animals and vegetation - a lush green biome, a hot, desert one, or a wintry cold one. Each offers its own challenges in terms of ongoing evolution, but each puts you in the thick of the action where you'll see animals milling around and plants providing shade. This is an immediate and much more satisfying way of getting people stuck into the heart of the game from the outset. The game is also much clearer about the end goals. Or, at least, when compared to my memory of Birthdays The Beginning (it has been around a year since I last played that game). Happy Birthdays makes it explicitly clear that the endgame that you're targeting is to manipulate evolution to the point that humans are "birthed." From what I recall Birthdays The Beginning was much more interested in presenting itself as a sandbox without any substantial goals. Assuming I'm remembering this right, it gives Happy Birthdays an oddly religious tone in comparison to the original; a much stronger sense that evolution is guided by an omnipotent hand - in this case, yours. Of course, Happy Birthdays isn't really preaching. 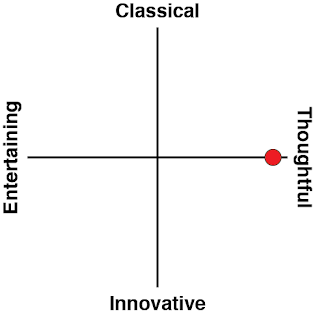 It's a game from Japan, where Christian philosophy has minimal resonance. 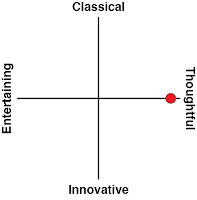 It's just as easy to read the game as something akin to Zen Buddhism, where patience and respect for nature are equally critical in teasing out the meaning of it all, or Shinto, which teaches that everything has its own spirit, and therefore your anxiety that a favourite species is slowly going extinct is certainly warranted. Perhaps the best way to describe Happy Birthdays is that it's a highly spiritually-driven game without being beholden to any particular ideology. Wada would never want to introduce that sense of conflict into his work. Regardless, having a specified goal does help to provide direction to newer players and helps ease them through the systems as they learn how to play. I'm still convinced that the best way to experience Happy Birthdays is to play it on a sandbox setting and start from scratch, so there is no sense of an end goal, however relaxed the game is about getting there, but nonetheless all the tweaks that have been made to the game are for the better in making it seem less alien and hostile to players in those initial stages. Happy Birthdays is remarkably easy to play. All that's involved is raising and lowering land to create mountain ranges and oceans. The affects the temperature of the environment; the more water and the deeper the oceans, the warmer and more humid the climate will be, while you'll cool the environment with mountains and lots of land. Based on those climate conditions some animals and plants will thrive, while others will die out, and your job is to ease along the climate in tiny increments to ensure that new life can be birthed into the ecosystem without causing massive climate change and a mass extinction event. Yes, in addition to teaching people about the delicate balance between species in an ecosystem, Happy Birthdays has a strong environmental message, and for anyone that has wondered about the impact of human-induced climate change, you only need to throw up the temperature of your little Birthdays ecosystem by a couple of degrees to see what can happen. While the game is simple to play, and while one or two degrees might not sound like much of a difference, this data running in the background of this game is substantial, and the knock-on effects over both a short, and longer period of time, are both frighteningly authentic, and just plain frightening. For such a bright, happy, cute game, the core of what Happy Birthdays tells us is both potent and important. This is a game about environmentalism, respect for the ecosystem, and it's a chance to watch the form that evolution takes in a palatable and enjoyable manner. Wada's most famous work, Harvest Moon, did a remarkable job of highlighting the life of a farmer to people who may have never comprehended what a country lifestyle might look like, so too has he made the basic idea of evolution accessible to people of all ages in Happy Birthdays. This game's predecessor was remarkable. This game itself is a remarkable evolution of that original vision.